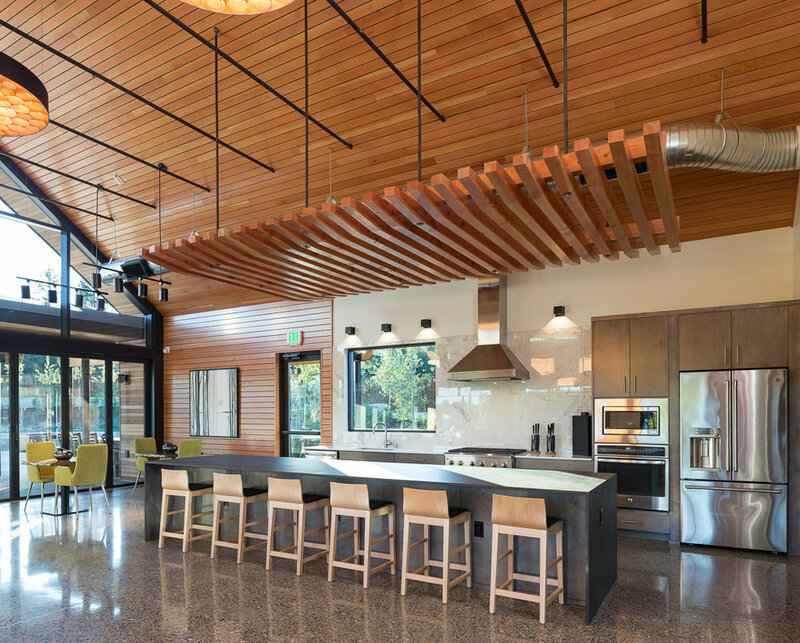 The community pavilion for Ovation at Oak Tree is the first amenity building to be completed for a new development of single family homes near Olympia. The site provides a picturesque setting with gentle slopes and scenic trails through groves of mature oak trees. By providing both the architecture and interior design, a seamless collaborative effort between JA and JA.id ensured a cohesive design approach and end product. From the beginning, the concept called for connection to and inspiration from the old stands of oak trees adjacent to the site. The result is a warm, textural interior that envelops the space in natural materials, with subtly shifting light and shadow playing off the weather and time of day. Simple materials and a restrained color palette give precedence to the architectural forms and allow the expansive floor-to-ceiling views to take center stage. The large decorative pendants in the main gathering area continue the repetition of steely matte black accents and feature glowing coils of natural wood veneer. Exposed aggregate concrete floors and warm fir wall and ceiling cladding continue beyond the glass building ends, playing with the visual boundary between indoor and out. The resulting experience is one of easy, lasting communion with one another and with the abundant pacific northwest scenery just steps away.